The Background Vocalist makes her money from two main revenue streams: 1) salaried TV work, which has led to more core TV work, and, 2) live performances and recordings as a background vocalist. As a result of these initial income streams, she continues to earn the TV/film mailbox money – or residuals – that are a byproduct of the union contract governing TV and film work. The recording mailbox money from the AFM & SAG-AFTRA Fund is a byproduct of the recording session work. 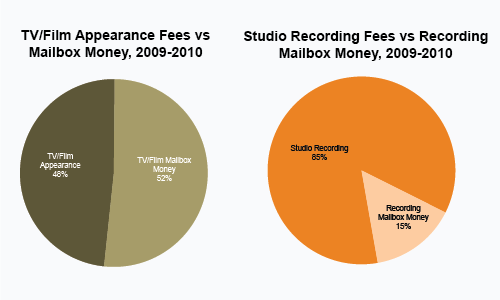 Over 2009-2010, mailbox money from both television/film and sound recordings has clearly represented a substantial part of the Background Vocalist’s income.